Flat 8, The Granary01263 715779work01603 870304fax Self-cateringA former granary, now a collection of luxurious apartments, overlooks spectacular views of the ocean and marshes. The outside of this property maintains a traditional aesthetic, yet the interior exhibits a minimalist character with comfortable furniture and useful utilities. With a lift from the ground floor to the third floor of this ideal apartment, those with mobility problems can stay here and enjoy all that this area of the North Norfolk Coast has to offer. • Other: Towels provided. 2013 Notes: No children - babies possible if you bring your own travel cot. You are asked to restrict noise in the building between 11pm. and 8am. inclusive. 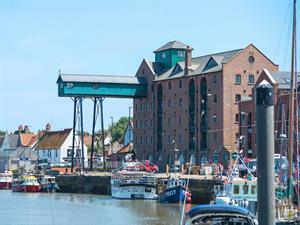 Flat 8, The Granary offers weekly bookings starting on Saturday. A former granary, now a collection of luxurious apartments, overlooks spectacular views of the ocean and marshes. The outside of this property maintains a traditional aesthetic, yet the interior exhibits a minimalist character with comfortable furniture and useful utilities. With a lift from the ground floor to the third floor of this ideal apartment, those with mobility problems can stay here and enjoy all that this area of the North Norfolk Coast has to offer.